This should not be happening. Check carefully for any loose fixings, including the foundation bolts and major az-el strut fixings. Check that the subreflector and feed support tube are secure. It could be that you are not pointed well. If you have manual pointing (not motor autotrack) check that your main beam is centered on the satellite. �If you are part way down the side of the main beam, wind movements will cause both increases and decreases in level. I suggest you download (1.3 Mbytes) and print out for local reference. �There are many details about how to tighten all the various fixings by the correct amounts. This information is important. I hope you discover some specific problem that may be quickly resolved. I don't recommend adding wire ropes to hold the dish reflector. If the dish reflector is moving about in 17 miles/hr wind and causing 4 dB drops in signal then there is either something loose in the mount or you are not pointed accurately. 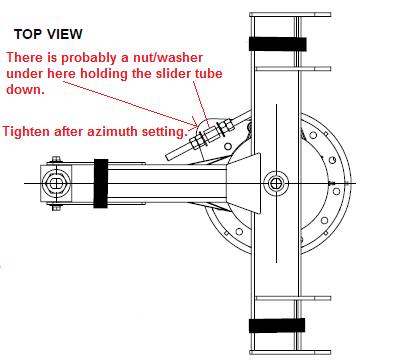 Is the manual azimuth adjuster loose ? �The distance of the adjuster screw from the vertical axis is quite short (about 30 cm) and this means the forces are very high, also any small movement, e.g. 1mm would cause 0.19 deg mispointing and 4 dB drop. I think there is a short vertical bolt underneath the azimuth slider. If this is not tight then it will wobble sideways under load. Is the main beam pointed at the satellite?. Put a spectrum analyser in zero span and 60 second sweep and check the antenna pattern in both directions: azimuth and elevation. �It will help your memory if you always record measurements while moving the antenna to the right or upwards. Beware of backlash and always approach the peak from the same direction (particularly in azimuth). Make sure you are not pointed on a sidelobe or part way down the steep sides of mainbeam.